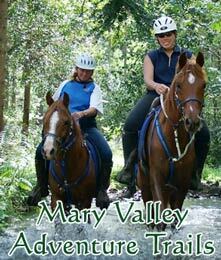 Mary Valley Adventure Trails operate Horse Riding Tours in the Sunshine Coast Hinterland. 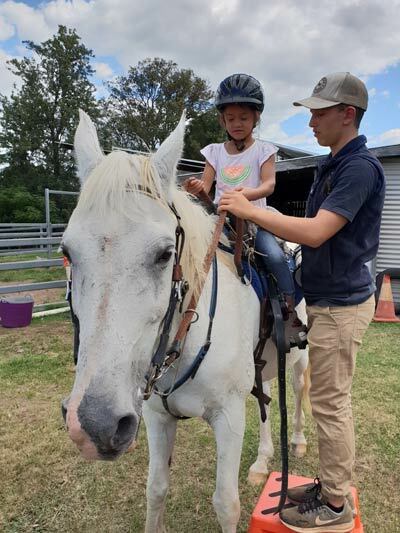 Ride adventure trails in Queensland's rainforest and farmland in the Noosa Hinterland's scenic Mary Valley, on the Sunshine Coast of Queensland, Australia. We conduct guided horse rides from 1/2day to multi-day rides through the Mary Valley. Half Day Rainforest Rides make a great holiday activity. 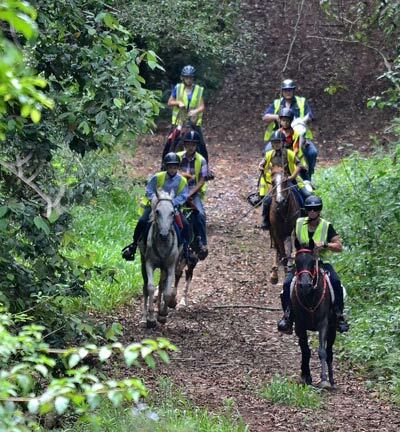 3 hour trail rides provide for a full morning or afternoon ride through the hinterland rainforest. One Day Mary Valley Ride. After arriving at the stables you will be helped to prepare for the ride. You will mount the selected horse and adjustments will be made to the saddle and tack to make it safe and comfortable. We will ride out through rainforest trails to the top of the mountain and have a spectacular view of the surrounding countryside. Rich farmland and vast areas of natural eucalypt and rainforest and plantation pine. We will spend the morning riding through this spectacular country to descend to a pre-determined spot for lunch. Multiple day rides through the vast network of trails are available. These rides can be arranged for our overseas visitors and local clients who want longer visits. You are able to ride the horses out as many days as you wish These multi-day rides will start and finish at our ride base. There is a vast network of trails that allow the rider to experience any number of rides from our ride base without traversing the same routes. Around each corner there is a new adventure. Camping is available at our ride base or at any of our suggestions below. Advance bookings are necessary. There will be approx 4 - 12 persons in each riding group. Guide and support crew will lead and assist. The itineraries may change due to inclement weather or other unforeseen circumstances. The pace of riding will be easy. We provide well fed and well cared for horses, comfortable saddles, safety helmets and tack. If for some reason you are unable to complete the ride schedule the support vehicle will be able to transport you at no extra charge. Please advise us about any special dietary requirements, allergies, medical needs or disabilities when booking. Alcoholic drinks are not included in the package. Alcohol consumption is not permitted before or while riding horses to comply with safety requirements. Responsible alcohol consumption at accommodation venues is acceptable. Hat, sunscreen, insect repellant, personal toiletries and medications. Clothes and equipment for the ride - Light shirt with long sleeves for sun protection is suggested. Jodhpurs if you have them. However, if you wear jeans or similar, it is recommended you wear pantyhose or tights under them to prevent chaffing. Riding boots or footwear suitable and safe for horse riding is required. If you have your own helmet, you may find it more comfortable, however it must comply with Australian Standards. A 'bum bag' is useful on the rides to carry essentials. A light rain jacket. Casual clothes for evenings. Small camera to record spectacular views and scenes. Your sense of fun and adventure. Jet North is now taking bookings for lessons. 1 hour is $30 per person. He will also be organizing the Special Fun Days for kids during the school holidays. Please enquire about non-riding partner and special rides to suit all interests. Ring (+617) 5481 1489 for more information. 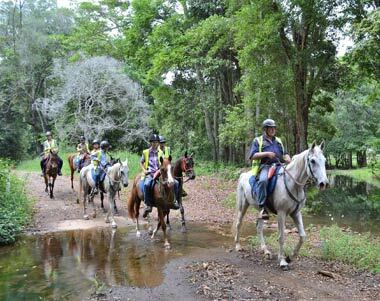 Ride our horses on any of our guided tours and ride through the State forest trails with unlimited access through our scenic property to the vast network of trails in the Amamoor, Kandanga and Imbil State Forests. Or, maybe, just relax and enjoy the views and the bush walks. 1) On-Site Camping - Camping is available at our stables. It is very pretty with nice walks along the creek. We can also supply camping gear and you can build a camp fire. 3) Lagoon Pocket B&B. Phone 0754 832 112, (click here for website). 4) Amamoor Homestead. Phone 0754 843 760, (click here for website).